In the early 1980s, Jim and his team were eager to take advantage of the growing audience for home video. Along with compilations of material from The Muppet Show and Fraggle Rock customized with introductory material (like the wraparounds videotaped on June 20-21, 1984), Jim wanted to create original programming specifically aimed at the home viewer. Jim was between productions and had time to consider an array of ideas. Jim went on to detail the different elements. Each show would include regular segments with dog training, dog warnings, and dog pep talks. Some episodes would include canine fashion shows or soap operas. Dog sports like Frisbee and water polo and great moments in dog history would be highlights. And attention would be given to the international brotherhood of dogs with visits to various breeds around the world. Jim loved dogs, but he saw home entertainment potential for other house-bound audiences, too. Cats, of course, were an obvious market. And house plants were ideal – they can’t walk away from the television set, and there was a severe lack of programming aimed at their demographic. In the end, Jim didn’t produce these videos, but check out some of his potential viewers in the Organization of Muppet Dogs. Learn more about Jim’s home video efforts in the 1980s including The Muppet Show compilations. 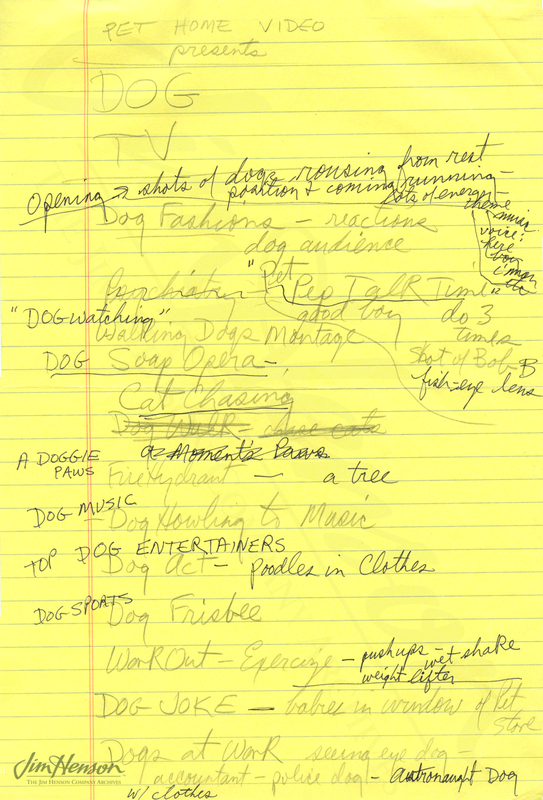 Jim’s notes about his Pet Home Video idea, 1984. Jim’s puppy Loki in 1960. 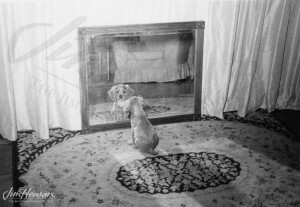 Looking at himself in the mirror, he seems to be ready for Dog TV. 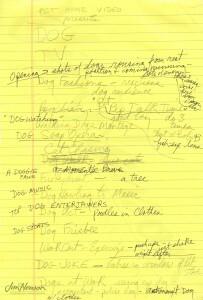 This entry was posted in 06-June '84, 1984 and tagged Dogs, Fraggle Rock, The Muppet Show. Bookmark the permalink.